I was invited by Roomnhouse.com to experience their service and review about it. 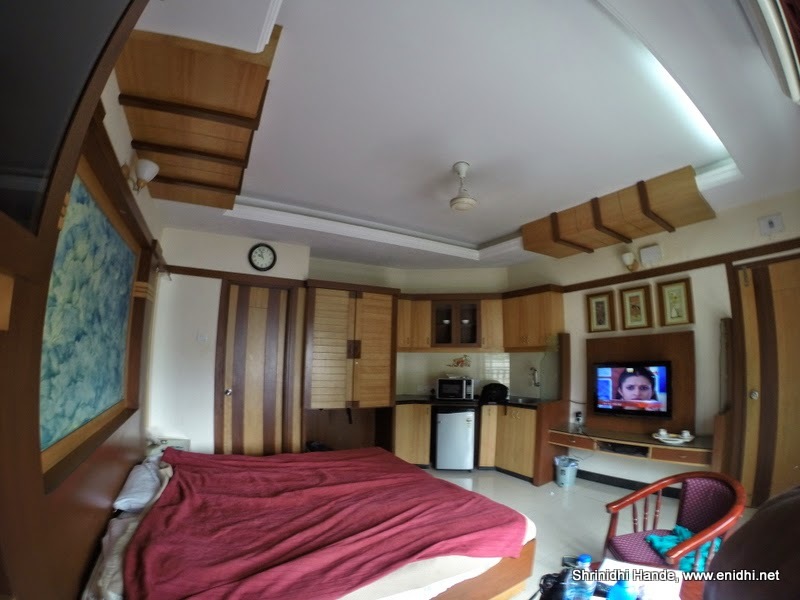 Roomnhouse.com is a portal for booking accommodations across various cities in India. It works on the lines of Airbnb to bring together hosts who have few rooms to rent out and travelers who are looking for homely stay. It is very convenient for small time homestay/paying guest/service apartment operators to rely on aggregators like Roomnhouse than maintaining a website and sales channel of their own. Though I had many relatives with whom I stay during my Blr visits, this time opted to spend a night at a place called “Park Avenue” recommended by Roomnhouse, to experience their service and share my experience. Unfortunately I ended up discovering lots of drawbacks in the services offered by the staff at Park Avenue, a 3 bed room facility located off Jayamahal Extension area, near Shivaji Nagar/Cantonment railway station in Bengaluru. Within a day’s time I got confirmation from Roomnhouse.com that my stay is confirmed. They also promptly processed a refund, since my stay was complimentary. I arrived in Blr on Friday night, went to my relative’s place and we went on a roadtrip Saturday morning. Since I was offered only 1 night stay, I opted to spend Saturday night at the Park Avenue. Their check in/check out time is 12 noon. Since I was driving around Tumkur, I could reach only late evening. I got few calls from the host and Roomnhouse that I’ve not yet arrived at the Park Avenue, I replied that it would take another few hours for me to reach. Despite having Google maps we had some trouble locating the address. After half dozen phone calls and few kms of driving around, we reached the Park Avenue building. On the website, Park town is listed as “Elegant Service Apartment” I am not sure what to call this place- It is certainly not a hotel, as it has only rooms, I can’t call it as “Service Apartment”, because there's hardly any service and this is not an apartment. Also apartments are expected to have some living room, common area, balcony etc. I can’t call it a ‘Guest house’ because staff attitude/service towards guest is very poor. So for all practical purposes, it is just an overpriced accommodation or bed and breakfast option in North east Bangalore area. It was 7.30 in the evening. I was given a room in second floor. The room was clean and decent. But the building is extremely small- had no common area, no lift and had a congested staircase. As you can see from the pictures, this building was constructed on a small piece of some leftover land and isn’t a full-fledged building in normal sense. Also the name 'Park Avenue' seem to be cleverly chosen- as there're many international brands using the name Park, Avenue or park Avenue itself. Any guest complaints online may not get easily noticed. Room was clean, had a refrigerator (empty and switched off), a microwave oven and a non-operational balcony. 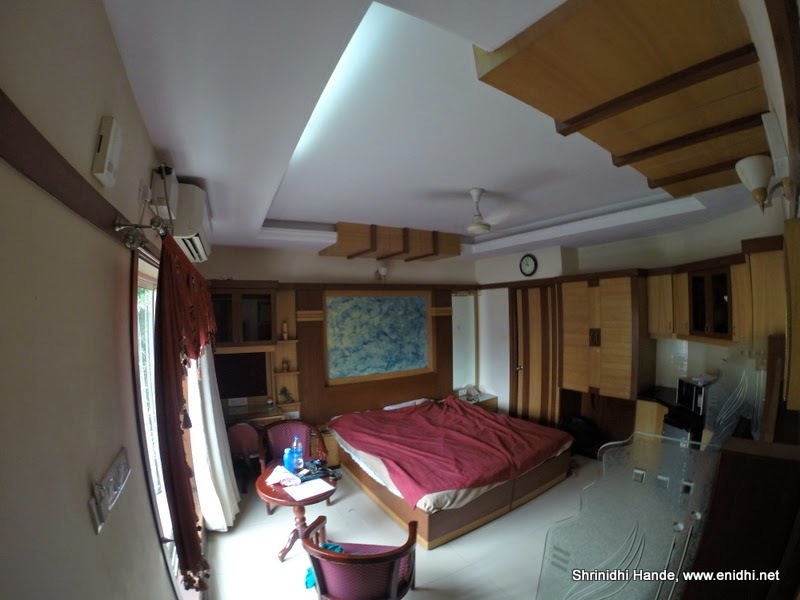 Photos of the rooms at Park Avenue below- clicked during checkout, so the bed is not at its best. Sorry- you can’t have keys to your room: Next shocker came when I asked for room key. I was told on my face that I can’t have one. I was told to lock and go out, (door locks automatically if a button is pressed) and once I am back, they would come and open the door. I was told they have only 1 key and can’t afford to have it missed. This is the first hotel/guest house I’ve ever experience, where I was told I can’t have keys to my room. The building has no security guard, no CCTV camera, room has no safety locker, so safety of your valuables will be at the mercy of two north Indian boys who work at this hotel, if you chose to go out leaving your valuables behind. I didn’t feel safe with this. I had to change my plans to ensure that one of us always stays inside the room, throughout the duration of our stay. When someone sees valuables worth several times their monthly salary, the temptation could be very high to steal it and claim innocence. If I report a theft I am sure management will not accept any liability and I will be left to suffer my losses. 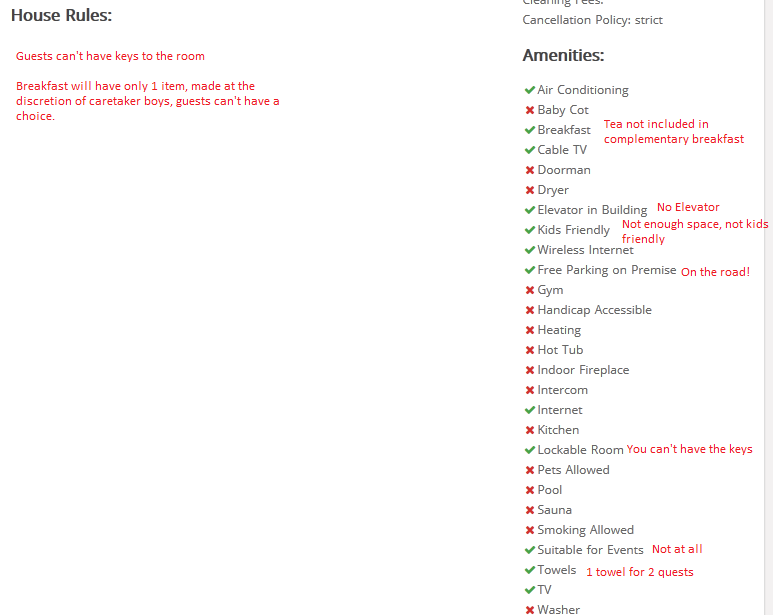 While on their website they listed lockable rooms, they are not giving key of the room to the guests. Most fundamental requirement is compromised. Probably the operators don’t own this place- they have rented it from owners and running guest house business. I understand it is common practice to leave the keys of your room at the hotel reception, but that is fine with well-established hotels with enough security and process, not to small scale apartments manned by two boys, whose background and credibility I have no clue about. Please park on the roadside: I realized that the building has no dedicated parking. I was asked to park the Safari on the road. I was reluctant because of 2 reasons- if some trees get uprooted because of heavy rain and falls on the car, I will have unnecessary headache in the morning. Second, parking on the street would invite unwanted risk of theft/damage. Hence though I had booking till Sunday early morning, I went to Dairy circle and returned the car Saturday night itself. Packed some good food from Hotel Kadamba in Shantinagar bus stand for dinner. Shande was kind enough to drop me back at the Park Avenue. Had I been told that there’s no parking space, I would have probably returned the car first and then come here, saving me another trip to Dairy circle and Rs 15/km that zoom charges. Calm neighborhood: One of the few good things about the Park Avenue in Jayamahal extension is that it is located in a calm neighborhood. Absolutely no noise of traffic or trains and we could sleep peacefully. This place is very close to Cantonment Railway station (Walk able) and 5kms from MG Road. Sir, your tap is leaking: At 6.30 AM I get a phone asking me to check the taps in my bathroom. I checked and confirmed that everything is in closed position. But the staff insisted that they’ve checked other 2 rooms and since they were not leaking, taps in our room should be leaking. They claimed they also heard the noise. Being woken up from my sleep, I was in no mood to continue this conversation and had no way to prove anything (who is right). Breakfast by 9AM only and that too Pasta: Next major disappointment came when I enquired about breakfast. I was told it will be ready only by 9AM. The printout on the table says breakfast will be ready by 7.30 AM. When I asked why so late, I get a reply that “because it is a Sunday”. When I asked why that is not specified in the printout, he had no answer. Next I ask "what is there for breakfast? "- I get a reply that it will be Pasta. I ask what else is there, I get a reply “nothing”. Of all the breakfast items in the world, they had to make Pasta that day. When I probe more, I get a reply that “same item is made for all the guests” and “because it is complementary, we don’t bother asking guests what they want for breakfast”. Nice trick to force people forgo their breakfast and save some money. I tried to explain that we don’t like pasta and would prefer something more sensible, I get a reply “Company Rules”. Since Park Avenue service apartment is located in some remote area, nearest hotel where I could find some breakfast was 3kms away. I had the pleasure of walking all the way and buying my breakfast, thanks to Park Avenue guest house’s unique company rules of not factoring the guest preferences. All they have is 3 rooms. If they can’t factor convenience of these 3 guests, what kind of satisfaction they can assure anyone? How difficult it is to make few other breakfast items like Bread Toast or Upma or noodles or things like that? Tea is not free with breakfast: Now that I’d forgone my breakfast option due to company rules, I thought I can have some tea at least. The next shocker was that tea is Not complementary with breakfast. Again first time I am experiencing an accommodation service provider who advertises complimentary breakfast but denies providing tea/coffee with it. By this time I’ve had enough of this place and wanted to get out. Obviously the two boys manning this facility have no training on guest service and no motive to do anything to comfort their guests. They have nothing to lose if I don’t visit them again. Obviously I didn’t appear like someone who would tip generously, so they stick to their “Company Rules” and deny me the basic services deemed standard when someone books an accommodation. I had the phone numbers of property owner, manager and few other people- If I had made the calls and complain, I could have probably got some of these rectified/compensated. But my mission was to experience their service as they offer and not to influence anything. I paid for my tea orders and left the facility. Once back in Chennai, I sent a mail to Roomnhouse support team explaining some of the pain points I had. I got an almost immediate reply that this will be investigated. 5 days later I did get a reply apologizing for inconvenience and standard explanation for the inconveniences, yet to get a reply on breakfast related concerns. Hopefully the owner changes “company rules” after reading this post and puts some corrective measures. - Train your staff a bit to consider guest requirements and expectations. - Update the websites to reflect reality- the property is not suitable for events, doesn’t have enough space for kids to move around and there’s no parking space. Do not lie. - Breakfast is something very basic to your guests- give some options or factor guest preferences while deciding breakfast item. You don't want your guests to go out empty stomach cursing their mistake of booking with you, just because your staff is lazy to cook few more items. Park avenue's listed page on the website http://roomnhouse.com/offers/hbvxzg needs to be corrected as below. Update: I noticed that Roomnhouse.com folks have promptly updated the page- below screenshot was taken a week ago, while current page shows red cross against elevator and few other items. Good job Roomnhouse. Service apartments and homestays are expected to give a better customer experience than commercial hotels. But this largely depends on the effort hosts take, to make their guests comfortable. Without this effort, stay won't be any different or better. Similarly portals that list properties should do adequate due diligence and surprise checks to ensure whatever is committed is delivered and things that are deemed basic/standard are offered. Ability for a customer to leave a feedback/rating is must, so that others can learn from previous customer's experience. For 2000 Rs a night, there’re 100s of other decent accommodation options in Bangalore. [Try stayzilla] I can’t think of a single reason why I should recommend the Park Avenue B&B in Jayamahal extension to anyone. I wasn’t expecting a 5 star experience and I could live with the few nuances listed above. My experience is an example of what all can go wrong in an accommodation experience, particularly when you chose a lesser known place without much verification. Pretty neat review ! hope the management takes this constructively and takes necessary actions. Very well written nidhi.I have stayed at this place thrice booked by my company.The place is really nice and homely.The caretaker bunty who used to take care is really generous chap and helpful.In the photos itself it looks very much spacious and nice.I think all the small issues can be handled easily.You should have taken help from owner or caretaker.My review for this place is really good;only thing is that there 1 or 2 items in breakfast like sandwich,poha,maggi etc which is filling.I think timing is must otherwise its difficult for caretaker to understand orelse you can inform the caretaker and he can be prepared. (even hotels have breakfast times8am-10am)being a bnb they have taken care of electricity savings nicely.In terms of safe there is cupboard with key which can be used as far as i remember.Looking at photos and deliverables it doesnt look like a bad experience but minute details have given too much of weightage. THanks Avik for sharing your experience. Yes, few of these are minor and could have been resolved if I had raised a voice or escalated to owner. I just chose not to influence anything and observe as it happens. My main concern was on the breakfast- words like "because it is free we don't ask our guests" or "only 1 item for all, irrespective of what guest thinks of it" etc. Simple words like "Sir if you'd like something else I can try" or "if you really need it earlier we will provide it sooner" etc could comfort the guests a lot. Quoting 'Company Rules' annoyed me. He outright refused to factor that I don't like Pasta or 9AM is little too late for me. Second aspect is the falsified listing- there is no lift, no parking etc, still these facilities were shown as available. THey have updated the website to remove lift and few other non existing facilities. They did reply on most of my concerns other than breakfast one, so looks like they will act on it. What a strange looking building! Surely built for pure commercial usage, small bath, no lifts etc. This "apt" is probably meant for business travelers who prefer this location and don't care about room , food delivery or services....a place to dump clothes and go to a meeting , come back late at night and sleep. For such a small guest list the owner will keep costs minimal, be it food, water or any other thing.. please adjust and do not disturb our boys too much! ha ha. I used Roomnhouses in pune last oct.
they have a nice customer service team who helps on the go-thats what i liked it about them. You should have taken immediate help from them or owner.The place looks nice. Will be using again in Goa next month.will keep you updated. Yes, within a week Roomnhouse have managed to procure a reply from the property owner and respond to me, also they have updated the website to remove some features earlier claimed to be existing at this facility. I thought about making a call and complain, but then decided against it. Just wanted to experience how this goes, without exercising influence. and yes, do share your Goa experience..
Roopvanti: May be you're right. Corporate guests sometime get better treatment than individual ones. Visitor feedback/rating will help greatly to assess a property. May be mine was one off case and everyone else got good service? We won't know unless there's a feedback mechanism. This is really pathetic. My guess is someone with some space and not living there, has tried to make some money out of it. And they have done so miserably!